Use this recipe to make donut holes or donuts. Super-moist, soft, and perfectly apple cider flavored for cozy fall mornings! This past Saturday morning, I spent some time making apple cider donuts and homemade dog treats. They’re better than I expected! The donuts, not the dog treats. Cozy, comforting, and perfectly spiced. Autumn at its finest. They’re the best cakey donut to go along with our 35 degree mornings. Seriously, where did fall go? Today’s donuts are baked, not fried. They begin with some strong apple cider. I didn’t have the chance to make apple cider from scratch, so I bought some from Trader Joes. 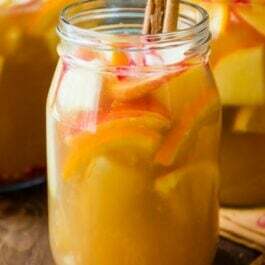 Any apple cider you like can be used, but I urge you to reduce the cider down for the best flavor. I simmered my store-bought cider with a couple cinnamon sticks and orange slices (seriously, try it) on low-medium heat for 15 minutes. The cider was slightly reduced and concentrated, thus resulting in a more pungent taste. Try not to drink it all- you’re going to need it for the recipe. I totally drank it. And had to make more. Ooops? Reduced cider will give your donuts a stronger apple flavor. More apple-y, the better. What else will you need for your cider donuts? Brown sugar, granulated sugar, melted butter, spices, plus a few more standard ingredients. Aside from the apple cider, the most important ingredient you’ll need is buttermilk. Buttermilk will make your donuts fabulously moist and tender, just as donuts should be. You can make your own buttermilk at home if you don’t have any on hand. See my notes in the recipe. You also need the right baking pan. As you can see, I made both larger donuts and smaller donut “holes.” Feel free to make just the larger donuts (14 donuts total) or the donut holes (32 total) or make a combination of both like I did. Let’s discuss the teeny tiny donut holes first because that is what we’re focusing on today. You’ll make these donut holes in a standard mini muffin pan. Surely you have one of those pans already from making my Glazed Chocolate Donut Holes… right? Just fill the pan up with batter and bake. Easy, peasy. Now, the larger donuts. I strongly urge you to buy a donut pan; mine was less than $10 at Target. You can buy the same one on Amazon. 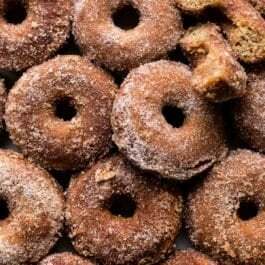 After the cider donuts are finished baking, they get a generous dunk into cinnamon sugar. If you’ve been reading my blog for awhile, you know I use any excuse to coat things in cinnamon sugar. Hopefully you’re the same. If not, you can leave the cinnamon sugar off. But… they are so much better with it! Bonus: if you have little bakers in the house, they LOVE doing the dunking. Perfect little weekend activity for ya. Easy baked donuts made at home! Use this recipe to make donut holes or donuts. Super-moist, soft, and perfectly apple cider flavored for cozy fall mornings! Preheat oven to 350°F (177°C). Spray a mini muffin pan or donut pan with nonstick spray. Set aside. Pour the wet ingredients into the dry ingredients and very gently mix together with a whisk. Be very gentle as overmixing will develop the gluten and result in a tough textured donut. Whisk until all ingredients are *just combined. * Some small lumps may remain, but not many. Pour the batter into the mini muffin pan, filling 3/4 full. You'll only need a couple teaspoons of batter for each. Or, if making donuts, follow my instructions in the post above about filling the donut pan. Bake the donut holes for 9-10 minutes or until a toothpick inserted in the center comes out clean. The donuts will take the same amount of time. Make the topping by mixing the granulated sugar and cinnamon together in a small bowl. Dip the top of the donut holes or donuts lightly into the melted butter. Then dunk them all the way into the cinnamon sugar, using your hands to mix it around so the entire donut hole (or donut) is coated generously. Repeat with all the donuts. You may need more cinnamon-sugar. Donuts taste best on the same day, though they may be covered tightly and stored at room temperature for up to 3 days. Room temperature egg is best so it mixes evenly with the warm melted butter. Bring an egg to room temperature quickly by letting it sit in warm water for 5 minutes. Don’t have buttermilk? You can make your own DIY version. Measure 2 teaspoons of white vinegar or lemon juice in a measuring cup. Then, add enough milk (skim, 1%, 2%, or whole) to the same measuring cup until it reaches 1/2 cup. Stir it around and let sit for 5 minutes. The homemade “buttermilk” will be somewhat curdled and ready to use.